This week is all about baseline. See, I’m a mountaineer, a hiker. I can have 40lbs pack in my bag and walk 10 hours straight on some steep hill during 30mph winds, but I never run. Sure, I ran on treadmill as part of my cardio training before or interval training, but I never done any long distance run, or consistent running within a week. So this whole thing is new to me. There’s a whole new thing I need to learn, different stretching technique, hydration (this one is similar, but have slight difference), even psychological aspect of the running. After a couple runs, I found myself enjoy that more and more. During the run, my mind is clear and it just me and my thought. Sure, i know my surrounding but mostly they are just background image for me. This is no different when I hike. Some people like to have a conversation during the hike, and I am a completely opposite. I don’t like to chit-chat at all. I like to be alone with my thought (or my music) during hike, and I found that running give me the same peace. I have a busy 10 weeks ahead of me, and hopefully I can improve my strength to do a long distance run (and survived this training!). It was raining and I was still exhausted from my climb. The lack of sleep during the climb started to creep in. I took today off from work so I can recover and I literally was in bed all morning. Around two o’clock, I started to contemplate the idea to go out and run. There’s this back and forth conversation in my head about ‘you should go out and run‘ and ‘but I just had my big climb and I’m so tired, and this bed is so comfy‘. Two hours later, I finally managed to put my running shoes on and walk outside. I put my hard shell on since it was raining and start running. I was greeted by the hill immediately and I never hate my neighborhood hills so much until I had to run on it! It was pretty brutal for the first 10 minutes and I did walked for a little bit to warm up. Then I set my pace and started to run. It wasn’t as bad as I thought. I wasn’t struggling at all to do 3 miles (other than on those darn hill). I remembered watching my foot moving and it was somewhat help me focus. I did the whole 3 miles on 44 minutes. Not bad for a first day. It was raining again and I was tired. I didn’t feel like running on my neighborhood cause I was still traumatize by those hills, so I decided to go to the gym. I hop on the treadmill and started to run. The first 2 miles went by so quick that I barely noticed, but the third miles – I was starting to get bored. I didnt’ feel a lot of struggles other than my mind kept wondering when I’m going to be done. By the time I ran the fourth miles, I managed to distract myself by reading – which help a lot. I finished 4 miles within 49 mins and felt pretty good afterwards. I woke up with a sore shins and hips. I vaguely remember this muscle pain (hips) earlier on my training for my climb. I thought that I did variety of strength training to strengthen my hips, but I guess running move the muscle in a completely different way than hiking. I iced it and took some advil and decided to take a rest today. The sun was out and it was a beautiful day! I was going to just run on the treadmill at this gym by my work, but decided to run outside and enjoy the nice weather. I mapped out my run, and head out to the waterfront park. I started with just a walk for about 10 minutes, to get my closer to the park, so I can warm up. I did 3 miles and I felt great! I love running there! The water gave it a nice breeze so it wasn’t too hot and I can see Mt. Rainier as I was running! It’s a long run day! My Team In Training Coach, Andy Mount, uploaded my training plan to my Training Peaks calendar and he put me down for 6 Miles today! That kinda caught me off guard a bit since I never run that long but when I told him that, he told me that 5 Miles is okay for this week, and even suggested me to do run/walk routine. Run for 6 minutes and walk for 2 minutes. What?!? 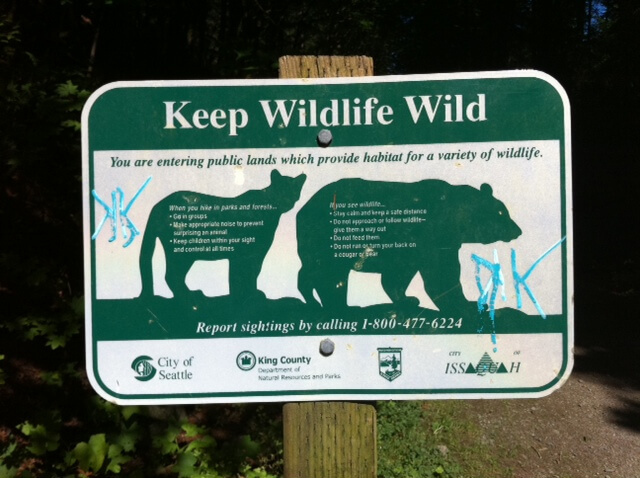 There’s a bear in this trail? We headed out around 8:30am to Snoqualmie Valley Trail. The plan is to have John ride the bike alongside of me (so he can carry my water, heh) and we get to spend some time together and do our work out since he can’t run with his hip right now (he was diagnosed of Avascular Necrosis 6 months ago). We park the car and head out to the what it looked like a trail and I started to run. After a mile, I realized that we came back to where we started and a bit confused. Turn out that the trail that I was on, wasn’t the one that I was supposed to be, but I decided to keep on going. I did a loop on that dirt road and ended up run for 5.3 miles (well, I walked for 3/4 miles and run the rest). I felt great during the run and afterwards. My left hamstring feel a bit tight, but it was better after I stretch them. I was pretty psyched when my iPhone app told me that I just completed 5 miles! We drove around for a bit afterwards to look for the right trail and finally found it. I know where to go for the next run! Yes, I know y’all just donate and support my climb but I also know that you are all very generous people and I hope that you can spare a latte this week and help me fund my future medicine. Yes, I’m not kidding. The money that raised from this event will go to research and development as well as patient support program for Leukemia & Lymphoma Society. 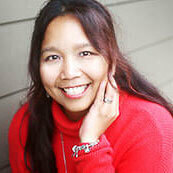 Those research, hopefully, someday, will find a new cure or new medicine for blood disease. Or, let me make it simple. For me, since I’m a survivor with leukemia. Check out the detail on my fundraising page at http://tinyurl.com/HelpYanni. I have raised $400 so far, and a huge thank you for those who believe in my cause and supporting me. You know who you are. I love you all. When asked why he climbed the mountain, Sir Edmund Hillary, the first person who stood on the summit of Mt. Everest, said ‘because it’s there’. When I think about it, that’s one of the reasons why I climb the mountain too, among other things. Some of you probably already know, since you were following my progress live, that I did not summit the mountain. Two factors that were completely out of my control, my health and weather, prevented me from going further. Did I feel disappointed? A little bit, of course. I’ve been training hard and looking forward for this day, but I felt more proud more than anything. I got to see a view that only a few of us are able to see. I got to watch the most beautiful sunrise between the mountain range, and the most beautiful stars in the sky. I got to experience this whole thing with my husband, the love of my life. This mountain, Mt. Rainier, is a hard mountain. The weather could change from hot, sunny, no clouds to 30mph wind, rain and no visibility with no warning. For some of us, who live at sea level, being above 10,000ft with no acclimation period, can really push your limits. Then, add that with 30mph wind, cold wet wind, while walking on a 60 degrees ice hill, with 400ft crevasse next to you – things could get a little hairy up there. We gave it our best, but it wasn’t our day. Only three of our team member reached the summit, while the rest of the five of us did not. I hope that I didn’t disappoint a lot of you, who follow my progress live, who continuously cheer me on, who relentlessly give the support during this whole journey. The mountain is calling my name to come back, which I will. 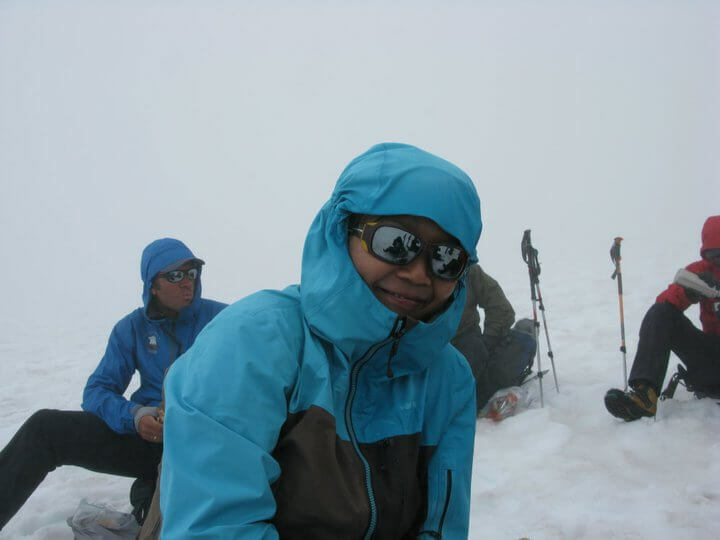 I have entire year to get myself healthier, better and condition even more before joining American Lung Association, Climb for Clean Air team again – to give the summit another try. Why? Because it’s there. Because I love being out here and the mountain, this particular mountain, is so majestic and keep calling my name to come back. I stood on top of this mountain 6 years ago and I’m itching to come back and repeat that experience. Why Climb for Clean Air, you might ask. There is more than one guide service that I can always go to and have them guide me to the top of this mountain. I don’ have to wait until next year. Heck, I can go again in the next few weeks if they have an opening. That’s all true. However, I absolutely love what American Lung Association of Washington does. I have a lung disease. My daughter has asthma. I would love, someday, to not struggle with it anymore. 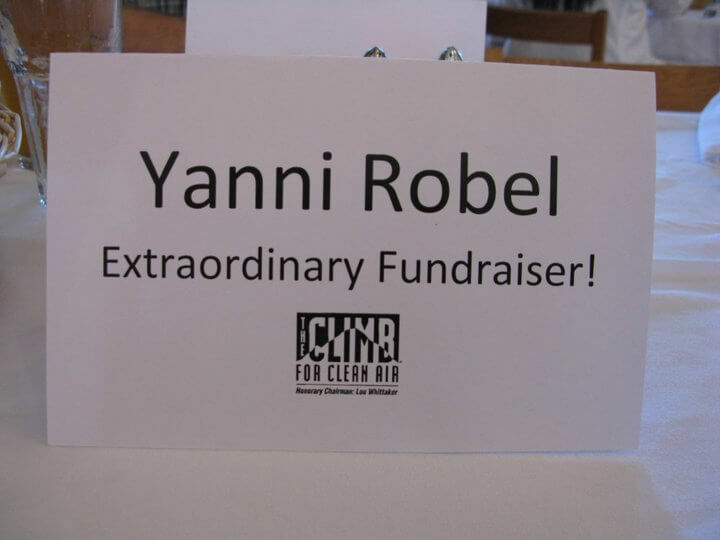 The funds that I raised, the ones that YOU so generously donated, helps them to promote the clean air campaign, as well as the research for vaccines and cure of all lung disease. So what would be better than combining the love and passion for the mountain, and the cause that I believe in? That is why; I will join 2012 Climb for Clean Air. I hope you will support me again next year the same way you did this year. I hope that you will generously donate to their effort through this campaign and help me reach my goal again next year because by doing so, you are helping them, help me. You are helping thousands of people who have lung disease and give them hope. That’s my personal goal. If I can do this, and not let my limitation stop me for doing things that I love to do, I am hoping that other people who have what I have can be inspired to do the same. It was raining and cold on Thursday morning. We huddled up and were told to wear our base layer only on the upper body, and no base layer on the lower body plus our hard shell for top and bottom. The goal was to walk on steady pace, not to sweat too much and keep our clothes as dry as we can. We started to walk around 10am. I was feeling good and the rain didn’t bother me as much. We stopped at our first break about an hour after at 6500ft. I ate and drank, and tried to keep my body as warm as possible. The wind started to pick up and it was cold. I was feeling strong. We continued to walk and the wind started to pick up really strong. As we walked up the rock, I started to be a wee bit behind the rest of the group but still feeling pretty good. Jake, our lead guide, started the pace for me and I was told to stay closely behind him. The visibility was really poor. I can barely see 20ft in front of me. The fog and rain, plus the wind were made the whole hike become more difficult than what it usually was. Our second break was around 7300ft, a short hike above Pebble Creek and the weather just got worse and worse. I started to get worried. I knew this route by heart and I’ve been on this route every single weekend in the last two months but this cold air and moisture really, really hard on my lung. I shivered as we sat down on our break, tried to chug half litter of water and ate our snack. I was thinking to send a check-in from my GPS but I can’t even get my hand off my gloves, so I gave up. Fifteen minutes later, we got up and started to walk. Muir snowfield never seems so unfriendly. This snowfield is not a strange place for me, but with poor visibility, I barely can tell where we were at. I slowed down my walk a bit to compensate my breathing. Whenever I did pressure breathing, I let cold air irritate my already irritated lung. I kept on going, one foot in front of another until we got to our third break, somewhere at 8500ft, shortly before the base of the moon rock. My hands were so cold and numb, and I quickly switched to different gloves. My feet started to feel numb as well but I braved through it. I shivered badly and I started to feel some tightness on my chest. I had tears in my eyes because I knew exactly what it was. I kept on praying; please let this tightness go away and tried to think something positive. We continued to walk and the wind blew even stronger. By the time we got to the last hill after the moon rock which about 9200ft, I could only walk slow since the tightness in my chest was getting stronger. Elias, one of our guides, walked with me and John. 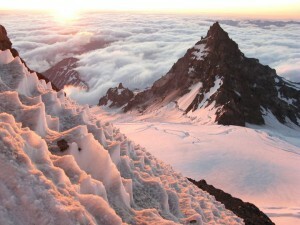 I took one step at the time, one foot in front of another, focusing on just getting myself to Camp Muir. From the distance, I saw the rest of my team sit down on their fourth break, which was about 9600ft and I told Elias that I want to skip that break. I would rather walk slow and take 30 secs breaks when needed to get deep breaths rather than sitting down for ten or fifteen minutes, so we did. I started wheezing as I was walking, and coughing and my chest felt tighter and tighter. My tears started to fall down on my cheek because I knew what this meant. I worked soooooo hard to come to this point and my body failed me. We finally got to Camp Muir about six hours after we started, which was not a bad time. I caught up with the rest of the team and rested. Jake, our team guide and I, had a little chat. 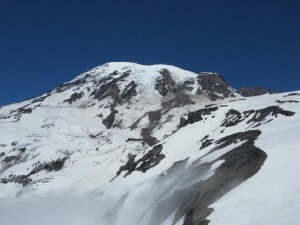 He was worried about me to go higher than Camp Muir because of my irritated lung, especially the weather in the upper mountain wasn’t really friendly. There’s strong wind and it was cold. I agreed with his assessment and as much as I wanted to go higher, I would put the rest of my team in danger because if I couldn’t recover fast enough, I would be a liability to the team instead of asset. I came back to the hut and rested. I let John know that I would stay behind and made him promise to keep on going and not stay behind just because of me. I cried on John’s arm but he assured me that I did the best I can and there’s nothing else I can do. We held hands and laid next to each other at the hut, and rested. At midnight, Jake came into the hut and woke us up. We were told to get ourselves ready and they were shooting at 1am to start walking. It was quiet and a lot of silence in the hut as everybody tried to get ready. There’s nervousness, as well as the unknown feeling on what’s out there. There were three rope teams of ALAW climbers. John was on Jake’s rope team, along with James and Lance, our fellow climbers. I stepped outside and stood next to John as he was getting ready. The sky was clear, even though we had very strong wind and about 30mph gust wind. I was in awe when I look up. There it was the most beautiful sky I ever seen with so many shining stars. The whole team left about 1am, and I walked back to the hut. It was cold, dark and windy. I laid there in the hut and I couldn’t go back to sleep. I worried about John, and the rest of my team due to the weather. The guide said that the weather was ‘workable’ which didn’t really give me warm and fuzzy feeling. I could hear the wind howling outside the hut and made the most horrible noise. The door suddenly opens a couple hours later. Erik, one of the guides, came back with two of my fellow climbers, James and Dean. They both got really bad altitude sickness, headache and nausea. They got as far as the first break, which was at Ingraham Flat (11,200ft). I was told that John still climb strong and keep on going, which was a huge relief for me. 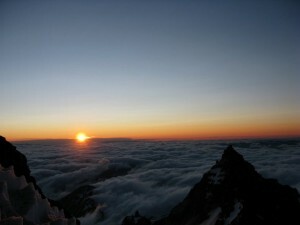 Then Erik asked me how I felt, and told me that he would take me to Ingraham Flat to see the sunrise if I was up to it. I jumped to the opportunity so quick. Jake and I had discussed that earlier but it all depends on the availability of the guide and how I feel. Around 4am, I was putting on my crampon, and had all my gear ready. Erik and I roped up together and started to walk across Cowliz Glacier. It was gorgeous sky. The sky was orange due to the sun that tried to rise. I took a deep breath and followed Erik. He set a really good pace and I kept the interval the whole way across the glacier. I saw a lot of rock fall and quite a big crevasse as we walked. The wind still blew pretty hard, and it hurt my face as we walked but I was excited. We got to the bottom of Cathedral Rock and started to climb up. There was a lot of loose rock and it was not an easy feat to walk on the rock with crampon. As we approached the top of the Cathedral Gap, Erik told me that John and another fellow climber, Chris, had turned around from the top of Disappointment Cleaver and they were resting at the top of the Cathedral Gap. I was excited to see John and kept on walking. The terrain changed from the rock to this solid 60 degrees ice. I took one foot in front of another and follow Erik to the top of the Gap. When we got there, we didn’t see anybody so we got a bit confused. Erik talked to Elias via the radio and tried to figure out where they were. Turned out they were waiting for me at the Ingraham Flat, which was about half an hour from where we were. He asked me if I want to keep going to the Flat. I was hesitated a bit, since I really want to go to there, but John and Chris, my fellow climber, were ready to walk back towards me. 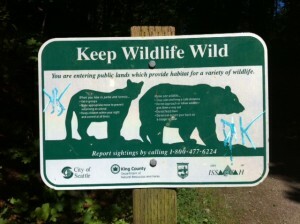 I didn’t really want to run into them on the 20ft wide icy trail with about 400ft drop next to me. I want to see John so bad and sat next to him and enjoy the view together so I decided to wait for him on top of Cathedral Gap. We found some spot next to the tall rock and sat down. I can’t really describe it here how beautiful the view was. Words can’t even explain. Little Tahoma mountain stood in front me, and I can see Mt. Adams, Mt. St. Helen, Mt. Jefferson, Mt. Hood and Goat Rock Range in the horizon. It was so peaceful and absolutely stunning. The sun rose up in the sky, gave the most incredible glowing color. I sat there quietly and soaked it in. I felt lucky, and blessed. I got to see the most stunning view that not a lot of people get to see. Sure, I would love to stand in the summit but on that very moment, I felt incredibly lucky. About 15 minutes later, I heard some footsteps and there was John. He was limping and I can tell he was hurting. He got to the top of the Disappointment Cleaver and decided to turn around because he knew that he would have a hard time to come back down. John was diagnosed with Avascular Necrosis six months ago on his right hip. There is no blood flowing in between his femur and hip joint and has been recommended for him to have a hip replacement surgery. He hasen’t done one yet and continued to hike with me, but this trip aggravated that even more. He felt that he would be a liability to the team if he kept on going. He told me that it was very windy and very cold on top of the cleaver, which convinced me even more that I made a good decision to stay behind. We sat down on top of Cathedral Gap and enjoyed the view together. For a second time, I felt incredibly lucky. Not only I am one of the few people that get to see this magnificent view, I got to see it with my husband. This is a win. 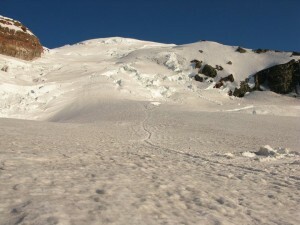 Thirty minutes later, we were heading back to Camp Muir. We got back to Muir about an hour later and rested just a bit. 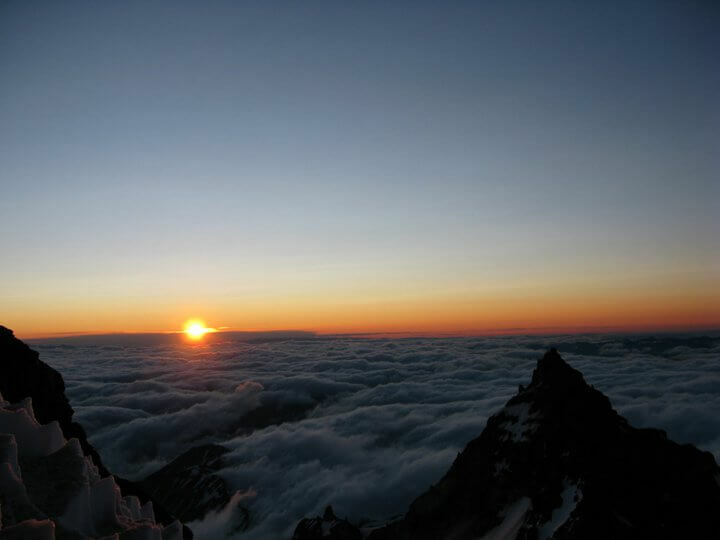 We were told three of our team member reaches the summit about 7:15am. I was so proud of them! Congratulations for Justin, Lance and Mark! Due to the weather, they only stayed up on the summit for 45 minutes and didn’t even go to the higher point in the middle of the crater to sign the book. Anywhere on the rim is a legal summit, and they will go into the parks records with the date and their names sicne they did make it. The three stayed at the crater rim just long enough to take pictures and head back down. Around 10am, we started to pack our gear to get ready back to Paradise. John and I had a head start since he might have to walk a bit slower due to his hip. It was an awesome day. The sun was out and there was absolutely no wind. The mountain was smiling at us. It was absolutely beautiful day. That was another proof that the mountain weather can change from one extreme to another without warning. We ran into Climb Team 3 around 8300ft and wished them luck. We glissaded off the mountain and took our time to walk. Around Panorama Point (6800ft) – I heard someone calling my name. I looked around and there was a familiar face. My best friend, Marisa, was hiking up to greet me! That was so awesome of her! We continued to walk down together and got to Paradise around 2pm. I walked to the Paradise Inn and immediately called my girls’s name since I knew they were there. Within a second, I heard my youngest girl scream out ‘Mama! !’ and follow by my oldest. They both ran towards me and leaped into my arm. That was double win! We had celebration dinner at 5 with Lou Whittaker and the rest of the team. I was recognized as an extraordinaire fundraiser and a great inspiration. I was honored. My girls got a little souvenir from American Lung Association as a token of appreciation on my behalf. Both John and I got our certificate from RMI and ALAW, did the whole photo and such. Overall, it was unbelievable journey. Despite the fact that I didn’t summit, I know that I accomplished a huge thing. I did my best and gave it all, and more. The mountain is not going anywhere and I will be back. Jake, Elias and Erik – thank you SO much for an awesome experience. You are an awesome guides and I appreciate everything you do to make this journey so memorable for me. I will see you around on the mountain! This is it. The day is finally here. Today is my climbing day. I woke up antsy, and nervous. I know I’m ready, but I can’t help to feel the anxiety and all of this ‘what-if’ thought in my head. The weather supposed to be decent and those strong winds supposed to slow down. I’m still crossing my finger for it since the mountain weather can change faster than you even realize. 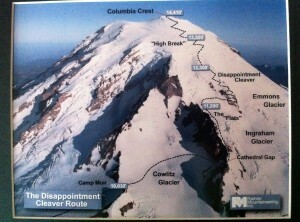 Today’s agenda is to go to Camp Muir (10,080ft). We are going to meet the rest of the team at 9:15am at Paradise and start to walk at 10am. It will take approximately 6 hours to get to Camp Muir. We are going to take a break every hour for 15-20 minutes. 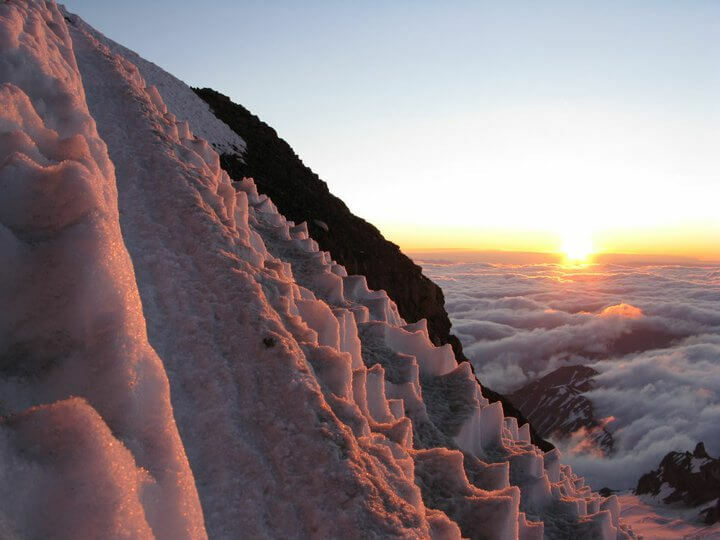 When we get to Camp Muir, we are going to rest, rehydrate and being horizontal (sleep is optional). We are going to start our upper mountain climb somewhere between midnight – 1am. Disappointment Cleaver is the route we are going to go through. There will be three break from Camp Muir to the Summit, and they are Ingraham Flat (11,200ft), Disappointment Cleaver (12,300ft) and High Break (13,500ft). 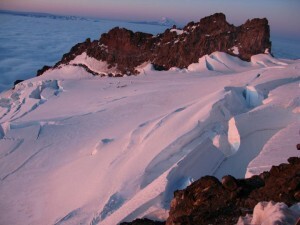 At the summit, depend on the weather – we could take an hour break or touch the rim and head back down. The whole trip from Muir to Summit take somewhere between 6-7 hours. Today’s climb is not an easy feat. It’s a hard, and tough and I’ll be hiking for a long time. It will be cold, very cold. There’s a lot of crevasse around, as well as loose rock. There’s always a possibility of avalanche. I can go on and on, and no, I’m not trying to scare my mom here. I’m just being realistic. However, I’ll be doing this with a professional guide services who know what they are doing. I know I’m in a good hand. I have trained for this day, and learned and learned more. Having said that, I am requesting everybody’s prayer for John and I safe and strong climb. For our strength and for coming back home safely with our ten fingers and toes. Please send us your positive energy, your warm thought and wish us luck. Thank you, very very much for all of your support. This is a joint effort. All of you are climbing with me in spirit. Today, it was a good day. Climb school was a lot of fun. We huddled around 8:15am, did a quick gear check and a little chat with the Jake, our guide. He recommended us to just wear one layer of upper and lower body, since the weather seems to warm up. We met the second guide for our team, Erik Nelson and we were heading out to Paradise at 8:30am. We walked for about an hour to our climb school location and during the climb, we learned about a proper rest-step and pressure breathing, which are vital for a successful climb. We also learned about the pace that we are going to use during the entire climb as well as walking with our ice axe. Ice axe need to be on the uphill side and needed for a balance point when you walk at the upper mountain. We also learned some uphill walking technique, such as duck-walking, and cross-over and some downhill walking such as plunge and boot skiing. It’s amazing a little thing that you do can increase the efficiency of your walk and preserve your energy! Then we got to the fun part. How to self-arrest and team-arrest during unfortunate situation such as, well, hope this never happen to me, but falling to the crevasse or if someone on your rope team fall into the crevasse. We hiked up to the top of the hill and slide on our back and our stomach facing down, and try to stop ourselves. I’ve been through this climb school before, 6 years ago, and this is like a refresher course. I even learned some new technique! Last part of the climb school are crampon and walking with rope. We learned on how to put our crampon and how to walk in crampon. Different efficiency technique and every little energy you can save up, you will most likely have a successful climb. We were done around 3pm and headed back to RMI basecamp. John and I were busy getting our gear ready again for the next day. Some of our gear were wet (that’s what happened when you slide a lot in the snow). The highlight for today is meeting Lou Whittaker. I adore Lou. He is a mountaineering legend. He gave us some wisdom, more tips and tricks and share some awesome stories. You know there’s a lot of stories when he was guiding people to the mountain since 1962! We wrapped up our session around 8pm and call it a night. John and I were back in our room, and getting our gear packed. The plan is to meet the rest of my team at 9:15am tomorrow, at Paradise. I’m pumped. I’m so ready. I am as ready as I can be. Fifteen weeks of training are to prepare me the next two days. Another day closer to my climb day! Today’s agenda is climb school and a fire pit chat with Lou Whittaker. For some reason I thought we were doing the fire pit chat yesterday with Lou, but it is tonight at 7pm. Yesterday we were only meeting our lead guide. During climb school, we are going to learn different techniques that will save us our lives in the event of unfortunate situation, fine tuning the technique of things that we are already know, such as breathing and walking. 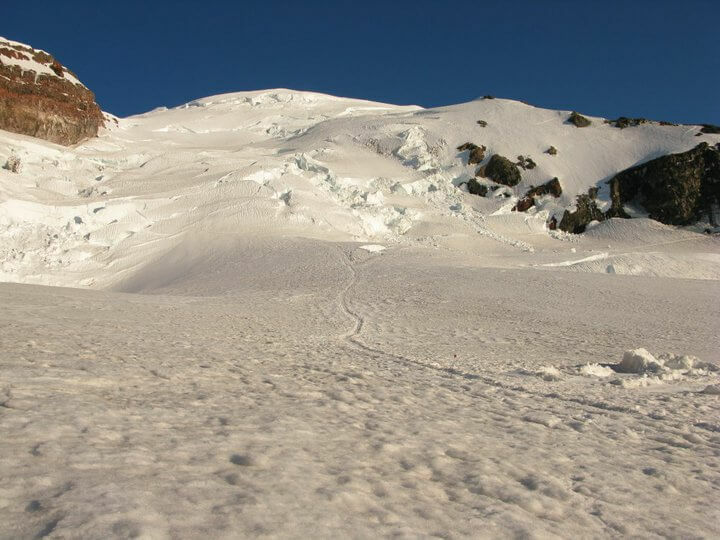 Learn how to self-arrest (just in case you fall) and team arrest (just in case your team member fall), walk on with crampon, walk with ropes and all other cool mountaineering techniques that will needed for this climb. My pack will be a wee bit lighter since the equipment list for climb school are not as much as the climb day. We are going to huddle at 8:15am and be at Paradise at 9:30am. We will be out and about until 3pm. As I am writing this post, it is raining outside. Not pouring, but sprinkle rain and a little bit of wind. It’s not a new thing for Seattle resident since that’s pretty much how our weather all year. Hopefully, wind stay the same and the rain will not get any harder. Well, I better eat my breakfast and head out. Thank you for your emails/tweets! Keep them coming, since I might need a little encouragement later when I come back from the climb school – super tired, wet and cold and question myself on why in the world I am doing this.